Collaboration is the bedrock of any joint exercise; projecting Canadian sovereignty in the Arctic hinges on it. But as the Canadian Forces have learned over the years, north of 60 everything changes – weather, sensors, communications, even the best laid plans. To improve its capability in the region and understand the capability of its partners, the CF through Joint Task Force North, one of six established under Canada Command as part of transformation in 2006, has conducted joint exercises in the past two years with two of the more knowledgeable northern operating agencies – the Royal Canadian Mounted Police and the Canadian Coast Guard. There is an obvious imperative to building common practices and procedures. The RCMP and the Coast Guard, along with Indian & Northern Affairs, have staked a federal civilian presence in the North while the Forces, through the Rangers, the Air Force and various electronic sensors, have projected a military one. But with the arrival of cruise ships, transpolar Russian trade, and the potential massive growth of energy extraction and exports, the Arctic Archipelago has become more crowded and more of a security concern. In August, the Coast Guard participated in the largest joint exercise to date in the North, Operation Nanook, held off the coast of Baffin Island in the Hudson Strait. The operation may have been about sovereignty projection, but one of the key objectives was to enhance inter-agency coordination and communication. The exercise, hampered throughout by the ever-changing weather, played out over 10 days and involved two scenarios: CF response to a request from the RCMP for assistance with a drug interdiction; and, CF response to a request from the Coast Guard for assistance with an environmental protection incident. For the Coast Guard, the lead response agency for oil spills and other maritime environmental disasters, the exercise was an opportunity to demonstrate the capabilities of both its equipment and crews. In the first scenario, CCGS Martha L. Black, a light icebreaker, delivered the CF and RCMP boarding parties to the vessel playing the role of the smuggler. In the second, however, Coast Guard took the lead to test the logistical support that could be provided by JTFN and other government resources in responding to a spill, including placing and recovering buoys and booms. It was also an opportunity to highlight the importance of flexibility. “We have learned over the years that you have to have very flexible plans and very robust back-up plans and work-arounds in place because it is almost certain that in the Arctic, life will not unfold as you have scripted it,” Gardiner said. Despite the weather-related challenges, the exercises proved invaluable at testing the communication systems and procedures of all participants. The exercise provided an opportunity to work through how information and tasking authority flows. But plugging into the CF’s robust communications system proved to be a challenge, LeBlanc admits. “If you’re not part of the security milieu it is very difficult to link into it,” he said. 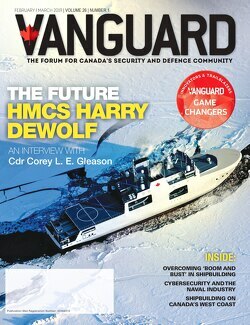 ”Something the Coast Guard will have to look into is increasing our ability to communicate beyond our sensors and with other government departments, especially DND, in a secure fashion.” Gardiner added that initial clearance to access the RCMP’s security apparatus also presented a problem that needs to be resolved. While Nanook (2007) and Lancaster (2006) were the first joint operations in the Arctic, the two agencies have a long history of interoperability. Within the federal Search and Rescue (SAR) System, DND has the lead for overall search and rescue (SAR) but the Coast Guard is the lead agency for marine SAR, with CCG officers co-located with DND officers at the Joint Rescue Coordination Centres at navel operations centres in Esquimalt and Halifax, and with the air force in Trenton. “That’s been going on for a long time and is considered to be highly successful but it largely flies under the radar,“ Gardiner notes. Both are already building on the success of the exercises. Gardiner and Brigadier-General Chris Whitecross, commander of JTFN, have begun planning an exercise for later this year that should see the Coast Guard take a greater role in scripting its scenarios. However the next exercise plays out, it will undoubtedly add to the familiarity all agencies are gradually acquiring with each other and the Arctic.